ICANN hosted a strategic planning session at ICANN64 to engage in community discussions with the ICANN Board and the ICANN organization executives in order to finalize ICANN's Strategic Plan for Fiscal Years 2021 to 2025. Please click here for access to a recording of the session. The purpose of strategic planning is to set out the long-term strategic objectives for the organization, reflecting the ICANN mission and vision. Strategic planning is a fundamental part of ICANN's governance, mandated by the organization's Bylaws. 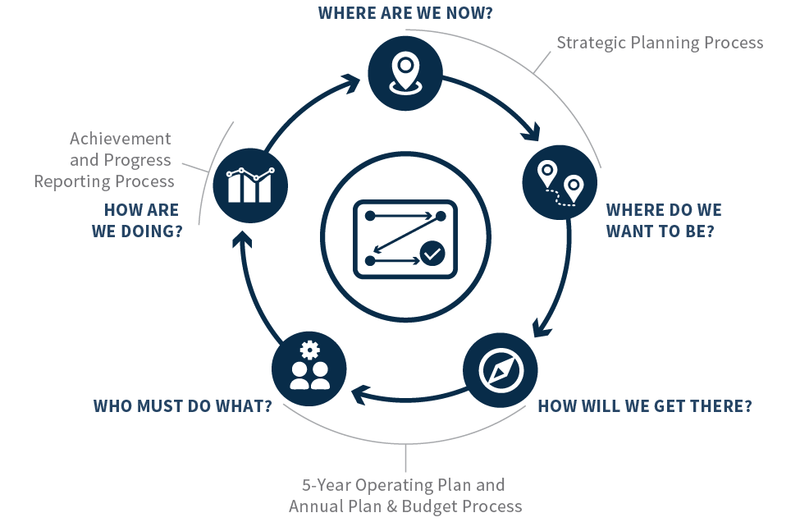 Strategic planning is a core element of ICANN's three-fold planning process cycle, namely the Strategic Plan, 5-year Operating Plan, and the Annual Plan and Budget process. Strategic planning helps answer two very important questions: where are we now? And where do we want to be? Once the strategic planning process is completed, the next step is to develop ICANN's 5-Year Operating Plan, and Annual Plan and Budget process. These plans answer the questions: how we will get there and who will do what? They help ICANN fulfill its mission and vision by putting the objectives of the strategic plan into action. The cycle ends with ongoing achievement and progress reporting to help us answer the final question: how are we are doing? The strategic planning process can be broken down into four phases: trends identification, trends analysis, drafting of the strategic plan, and finalization of the strategic plan. The community, Board, and ICANN organization participate in trend identification sessions to engage in a discussion on emerging trends that could affect ICANN. The trend identification process repeats annually to help inform ICANN's strategy in an ever-changing environment. The ICANN Board assesses the impact of priority trends and shares a proposal with the ICANN community for consultation. After receiving community input, the Board defines objectives and goals that will serve as a foundation for the strategic plan. The Board oversees the drafting of the five-year strategic plan. The ICANN community provides feedback and input on the draft strategic plan via the Public Comment process. The ICANN organization revises the draft strategic plan based on community input and the ICANN Board then finalizes and adopts the new strategic plan. The strategic plan will not go into effect until after the Empowered Community considers whether it will reject the plan. If the strategic plan is rejected, ICANN will consider the reasons for that rejection and propose a revised plan. Learn more about the Empowered Community process here [PD, 188 KB]. Every year, new trends or shifts in existing trends impacting the operating plans (five-year or annual), and/or budget, will be factored into the annual iteration of those plans as appropriate. Significant shifts could result in appropriate adjustments to the strategic plan, following the strategic planning process described above. Or, should trends be less significant but still relevant for appropriate adjustments to the 5-year operating plan, those adjustments will be made through the relevant process. Community participation is a critical component to the strategic planning process in collaboration with the ICANN Board and the ICANN organization. The strategic planning process is designed to ensure continuous participation of the ICANN community throughout the development of the plan. This includes running strategic outlook/trend identification sessions with stakeholder groups, information sharing via webinars, public sessions at ICANN meetings, and public comment opportunities to provide input on the development of the strategic plan. The strategic plan consists of ICANN's mission, vision, objectives, and goals over a five-year time-frame. ICANN's mission is its purpose and why it exists as reflected in the ICANN Bylaws. ICANN's vision is the desired future state of the organization, or where ICANN wants to be at a given point in time. The vision and mission work together, with the strategic outlook input, to inform and define ICANN's key strategic objectives. Each objective is then broken down into more tactical goals that the ICANN organization works to achieve over the five-year strategic planning period. By achieving its goals, ICANN is able to meet its objectives and fulfill its vision so that it can continue to deliver on its mission in an everchanging landscape over the five-year period of the strategic plan. ICANN is currently operating under the Strategic Plan for fiscal years 2016 - 2020. Please find links to the Strategic Plan for fiscal years 2016-2020 in seven languages, including supporting materials, and resources below. The work on the next iteration of the Strategic Plan for fiscal years 2021 -2025 began in January 2018. This section provides a central resource to share progress towards developing ICANN's next strategic plan, including key reference documents and other useful links. Phase 1 – Strategic outlook/trends identification: completed. The ICANN community, the ICANN Board, and the ICANN organization participated in and completed the process of identifying strategic outlook trends in June 2018. Phase 2 – Strategic outlook/trends analysis, prioritization and impact: completed. The ICANN Board and the ICANN organization have conducted an analysis of key priority trends and their impacts on ICANN. The next step will be to engage with the ICANN community to share findings for community input and consideration via a webinar, and a public session at ICANN63. Phase 3 – Drafting of strategic plan: completed. Phase 4 – Finalization of strategic plan: not started. On 16 October 2014, the ICANN Board adopted a Strategic Plan [PDF, 1.65 MB] | Mobile Accessible [PDF, 408 KB] for fiscal years 2016 – 2020. Developed through an extensive, collaborative, bottom-up, multistakeholder and multilingual process, the Strategic Plan provides an opportunity for the global community to coalesce around a new overarching vision and long-term objectives. The Strategic Plan: articulates ICANN's new Vision; restates ICANN's founding Mission; and sets forth five Strategic Objectives and sixteen Strategic Goals, each with Key Success Factors (Outcomes), and Strategic Risks. VISION: ICANN's vision is that of an independent, global organization trusted worldwide to coordinate the global Internet's systems of unique identifiers to support a single, open globally interoperable Internet. ICANN builds trust through serving the public interest, and incorporating the transparent and effective cooperation among stakeholders worldwide to facilitate its coordination role. Develop and implement a global public interest framework bounded by ICANN's mission. Do you have questions related to strategic planning? If so, please contact us by emailing strategic-planning@icann.org.